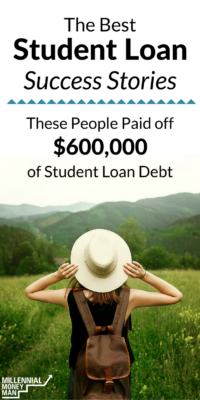 Best Student Loan Success Stories – These People Paid Off $600,000 of Student Loan Debt! I've been so fortunate over the past few years to be able to talk to so many people that have had success with their student loans. Unfortunately, I've talked to so many more people that need help and encouragement along the way. Currently, Americans have over $1.4 trillion in student loan debt. I remember exactly how crushing my $40,000 of student loans felt. It's a hard feeling to describe, and honestly, people that have never had to deal with seeing a letter from Sallie Mae in the mail can't fully understand how devastating it can be at the beginning of your career. Fortunately, there are people out there from different walks of life that have been able to fight the good fight and find ways to get past their loans and start living the life they always wanted to. I've pulled together some of the best student loan success stories for you! Claudia and her husband went to incredible lengths to pay off their student loans as quickly as possible. Like a lot of people, Claudia wasn't quite sure how to tackle her student loan debt after she received her bachelor's degree. She went to great lengths to pay off her debt (including living in a “tiny house”) and avoid lifestyle inflation as her income rose. After receiving degrees in marketing and accounting, Marissa and her husband knew they needed to do something to tackle their $80,000 of student loan debt. They learned how to sacrifice as a couple by driving very old cars and even renting a room from her parents after getting married. Beau and Brittany are both high school band directors in Texas. Beau had no student loan debt, and Brittany had over $100,000 in student loans! They got married and immediately started to tackle the student loans on their teaching salaries. To date, they've paid off an incredible amount of debt by picking up a very effective zero-based budgeting system (which they share in their interview). Sometimes people take a normal route towards paying the student loans off…and sometimes they take an extreme one! Emily and her husband were able to utilize the debt snowball method to pay off their debt, but they didn't just stop there. Now they are building their own homestead off the grid in an effort to reach true financial independence. Elizabeth and her husband were able to use their savings, the debt snowball method, and even their tax returns to crush over $13,000 of student loan debt in just three months! They also adopted a great budgeting system using Google Sheets (which they share in the interview below). Are you struggling with building up savings or paying off debt? David and his wife tackled that issue head-on and ended up paying off a ton of debt in the process. The best part? They are both educators and were able to live on half of their monthly income. Anyone that has had to face a sizeable student loan balance knows exactly how stressful it can be. We ALL want to pay off our loans as soon as possible. But is it worth messing up your health in the process of becoming debt-free? After Jen came down with stress-related shingles during her loan payoff plan, she learned how to achieve a healthy balance when paying back debt. There's a major misconception that high earners like doctors and lawyers don't have any financial problems. Many times, it's actually the opposite. Large salaries typically come at the high price of professional degrees and almost a decade in school. Emily Shared how she has been able to pay off a massive amount of debt and also shares tips for anyone that is considering the medical profession. Keep reading: Is Medical or Dental School Worth It? A Doctor Weighs In. How far would you go to pay off your student loans? Do you think that you could move into a tiny camper for months to get your spending under control? That's EXACTLY what Zach and Jenna did when they started tackling their $40,000 of student loan debt. They shared the ups and downs of living in a camper, and even included pictures of their tiny home! Tired of seeing all these student loan payoff stories from people with unrealistic strategies? Kyle was able to crush tens of thousands in debt with his teaching salary by a mix of sacrificing (he moved into his sister's basement and paid rent at one point) and extreme budgeting. He also side-hustled, changed his diet, and completely avoided buying new clothes. Usually, when you think lawyers, you probably imagine BMW's and Rolex watches. This lawyer decided to take a completely different path, and in the process was able to cut his spending back so far that he paid off $87,000 of student loans, and then took a $50,000 pay cut! He details his theories on rising income, as well as learning how to side hustle to supplement your income. Andrew is pretty incredible. He and his wife were able to crush over $50,000 of student loans in just over a year by living in an Airbnb and sleeping on the floor. They also cut back on alcohol, shopping, and even gift giving on their way to paying down their debt. Andrew's life is a lot different now (he makes well over $1,000,000 a year with his new business), but paying off the debt was the foundation for his success. This one is from yours truly! I used to be a high school band director and was able to pay off a large amount of debt in just a year and a half by living as frugally as possible. After I paid the debt off, I started this site and fell in love with personal finance. 6 months after starting this blog, I quit my teaching job to run it full-time, and now make a great living online. I shared every single one of my student loan payments in the article below. How much student loan debt have you paid off? That’s great to have a compilation of stories to read through. There’s not one way to destroy debt. I graduated after 9 years of schooling with over $100,000 of student loan debt. We tackled it and eliminated it within 20 months. My biggest tip would be to continue living the way you had prior to graduating. Don’t let lifestyle inflation take over because that’s less money toward paying down your debt. That’s a great point! We have let our lifestyle inflate a little bit now that we are a few years removed, but ultimately my wife and I lived the same after I paid off my debt and were able to save up a good amount of money (and start my business). Oh yeah, we have enhanced our lifestyle too. BUT it was after we paid off all our student loans. When you pay everything in cash instead of credit to live your life, you can do whatever you want now and not stress over it. I believe our (well my wife’s, but what’s yours is mine right??) student loan debt was somewhere around $50K. The number one thing was doing a budget. It’s simple, cliché, and people roll their eyes but when you know exactly where your money goes instead of wondering where it went, you are on your way. Really take a look at the needs vs wants. We cut cable (saved $125/mo), sold a bunch of stuff we never used, etc. Plus, it is only temporary. Once you’re out of debt you can always get cable again (you won’t, trust me). Haha great points! We haven’t had cable since our college days. Right now we rock a sweet antennae and have experimented with using Sling for about $20/month. I paid off my $40K student debt a couple of months before graduating by choosing my field and school carefully, starting to look for a job a year before graduating , doing paid overtime and side hustling. I’ll be honest – I haven’t met someone with that much student loan debt yet! Although I have met quite a few in the $300k range unfortunately. If you’d like to guest post and share your story I’d love to have in on the site! I saw the 600k and thought it was one person too! Although we didn’t have 600k in just student loans, they were actually 380k. The other 220k we paid off was our business debt. We did this in 4 years. When my wife finished her Ophthalmology residency, we decided the fastest way to pay off the debt was for her to go into business as a solo provider, live like a resident, and get to work! We took the two-prong approach, increase income as much as possible while also decreasing expenses as much as possible. It was tough while we lived in a house that was essentially a trailer, but the business grew and eventually, we paid the student loans off and the business debt! Now that we finished that big chunk, we are working towards paying off our new house. We can’t sit still and be happy paying just the mortgage payments after going through all we did to get here! I graduated from pharmacy school with $145k worth of student loans. My husband and I started off paying a little over the minimum payment but then went into overdrive and started paying basically my whole paycheck on the loans. We are projected to finish in feb after only 4 years. My tip to people is to keep going and don’t let the temptation of buying things get to you. While everyone around me bought big expensive houses and cars, we bought a modest house and live frugally. It can be done! Congrats! $145k in four years is incredible! Awesome stories Bobby, keep helping people! I never had student loan debt but I do know that success is contagious and for folks who do, just reading posts like this can and will help them get motivated. Thanks, will do! I’ve found that readers really like the success stories! I started with $141k in student loan debt after graduating with my doctorate in physical therapy. I’m still working at it- 9 years later I’m down to $57k and counting… I’m planning to reduce spending next year and get rid of it in less than 3 years… Pray for me!!! I’m inspired by all the people killing debt so quickly! Thanks for sharing these stories! Congrats, you’ve paid off a ton!!!!! Thanks for sharing all these stories Bobby (including mine)! Happy that I can be one of the people out there hopefully inspiring folks like you have.